Meets the first time with the men who go everywhere with a machete at the waist with a red mouth because betel no doubt make me so confused, too. That's probably my first impression when i visited several villages in the interior West Sumba in the province of East Nusa Tenggara (NTT/Nusa Tenggara Timur) in the context of malaria research for 4 years in this place. The men started from teenagers to senior citizens who have, and then passing with a machete, but eventually I knew that for them the machete is a symbol of manhood, is also a symbol of respect. A village head before we went immediately rushed into the house wearing a distinctive Sumba woven sarong, carrying machetes welcomed us pride. And what most impressed me was the habit of chewing betel nut men Sumba. If elsewhere the common betel is women, so here also is the betel habit of men. Chewing betel nut may be similar to smoking. It feels incomplete if they do not chew betel. They believe that in addition to delicious, healthy betel also turned out to be a drug even. Though when I tried to force to swallow because bitter taste in my mouth. 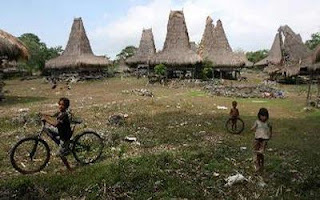 The habit of chewing betel nut was not only done in the village, but it is very common in the employees in such districts weetabula city, capital of the southwestern Sumba chewing betel. Another interesting thing from my trip to the hamlets throughout Sumba is about the grave. If on the other graves are usually far from the settlement in Sumba is usually built on the grave yard. Graves with construction as the box with a cover of stone. Formerly the stones used to build the tombs are natural stones are cut. You can imagine how many animals are sacrificed for the making of the grave only. But now many have made such grave cement casted. Interestingly that generally remained grave built not far from their home neighborhoods and built for one family. I had asked a Ratenggarong chief who was considered one of the old villages in West Sumba related resources of this unique cemetery. Apart from that so that has been inherited by hereditary custom he again builds stone tombs especially large and expensive with a big party it is also a proud family. That the grave yard of the house was built, it is a manifestation of their love of the people who have gone to stay close and always be remembered. Also in another hamlet I can explain that they are saving the grave in front of the house as an indication that the family is buried there is the owner of the land where the cemetery is located. Unique, I sometimes compare the cultures of Sumba in Toraja. There are some similarities. People Sumba and Toraja people both Christian majority but felt that the influence of custom is still very strong. For example in the matter of death and rituals. Held with great fanfare at the expense of so many farm animals such as buffalo and pigs, and in particular in Sumba is also a horse. Said a friend of Sumba, the whole issue here should be completed by a new old tradition brought to the church. How strongly they hold customary. In Sumba are many amazing things. Exotic nature. Savanna and grassland. The horses are running free with red lips smile population. Tradition Festival, when the knights in the battle against the agility of a stick javelin. Until the tradition of "beilis", dowries breast milk substitutes to be paid a man if you want to marry the girl of Sumba. Also a tradition to gather Nyale exotic beaches and the sea on the coast of West Sumba and West Sumba is so powerful and still a virgin. Not to mention the distinctive Sumba woven with color and exotic motifs. Maybe next time will be narrated, and from our Sumba menitip love for all Kompasianer in Indonesia, hopefully one day can visit here. I would be odd to see people carrying machetes.